The recent split within the Syrian military shows the government’s reliance on violence has failed. Peaceful protests are the way to bring about the kind of outcome people see as desirable, says the head of the Syrian Democratic Forum Delegation. ­Syria’s problems are international, regional, pan-Arabic problems. They cannot be resolved unless the conflict between the regime and the opposition is resolved, Michel Kilo told RT. Kilo had earlier been speaking to the Russian Foreign Ministry in Moscow. RT:What is the outcome of your talks with Russian Foreign Minister Sergey Lavrov? Michel Kilo: The immediate outcome of the talks was predetermined by the fact that you have, on the one hand, a delegation from a country where a full-blown war is raging, and a great power on the other. You can hardly expect a specific outcome. Essentially, we wanted Russia to hear us out, because we represent the oppressed people of Syria. We want to serve the people of Syria, we protect their interests, and we presented our position. I think we were frank and convincing. We told Russian officials what they needed to hear from various opposition groups in Syria. For the Syrian crisis to be resolved, Russia must assume a well-balanced stance. Russia plays a major role, but it should not be part of the problem. Russia has a long history of friendship with the Syrian people. The people of Syria expect Russia to help them gain freedom and overcome the current deadlock. The Syrians want Russia to take a fair approach, to be as fair as possible. Russia should not side with the forces that will surely lose in this struggle, that is, with the current regime. 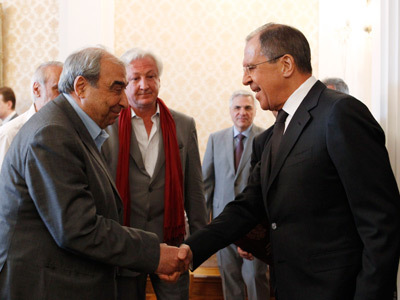 Foreign Minister Lavrov said Russia was not committed to the current regime in Syria, but had alternative solutions. Lavrov made a few remarks about the lack of harmony among opposition groups and mentioned arms deliveries and other military issues. We responded very openly and frankly to all these concerns. Our delegation said that the opposition has decided to present a common front at the Cairo conference and all opposition groups in Syria have signed the papers on a transition period and on the future of Syria. As regards arms deliveries, we have pointed out that the procrastination of the crisis makes it difficult to resolve the problem of arms. The sooner there is a fair solution to the crisis that would meet the demands of the Syrian people, the sooner it will be possible to cut the supply routes for arms deliveries. By standing in the way of resolving this crisis, those who are concerned about the arms actually act in the interest of those using those arms. RT: Do you think the Cairo conference convinced Moscow that the Syrian opposition is united now? MK: I don’t think so, not anymore. But I think Moscow is on the way to understanding the real situation with the struggle underway in Syria. The problem is, Russia looks at the situation from the viewpoint of the ruling regime, whereas, like I told Lavrov, it should look at the ruling regime through the prism of the current problems. These problems are bigger than the regime, bigger than the opposition, and even bigger than Syria. These are international, regional, pan-Arabic problems. They cannot be resolved unless the conflict between the regime and the opposition is resolved. The crisis cannot be resolved unless there is international consensus on the way it should be resolved, on the way that would take Syria to democracy through a transition period, as five powers, including Russia, have agreed in Geneva. This is why Russia’s role is very important. Russia can help resolve this conflict democratically. This will lead Syria out of the current deadlock and put an end to violence, bloodshed and destruction in Syria. What is happening today benefits Israel and possibly the US. If this destruction goes on and the ruling regime wins, it will rule over ruin and thus suffer a strategic defeat. If the opposition wins, it will inherit the country in an unmanageable condition. In any case, it is necessary to stop this violence, stop this bloodshed. All the efforts taken at international and pan-Arabic levels in order to put an end to the violence only make the ruling regime all the more harsh. Events in Syria may eventually pan out in such a way that Russia will lose – as will the people of Syria. RT: Do you think Syria has become an arena where international and regional players fight each other? MK: Definitely. And it was the ruling regime which turned Syria into such an arena from the very first day the popular uprising began. I wrote this less than a month after the uprising began. But they insisted on resolving the problem their way, and now they face the consequences. They face the consequences of their approach. Syria is being destroyed – street after street, city after city, village after village. What kind of solution is that? In order for a small group of people to remain in power, the whole country is being destroyed. RT: Would you be prepared to embrace Moscow’s proposal and engage in dialogue with the regime? MK: We are ready for dialogue with any groups within the regime that would agree to promote democracy in Syria. RT: Could that possibly include President Assad? MK: He doesn’t agree to it. And we don’t want to negotiate with Bashar al-Assad. Three weeks ago, he officially declared war on the people of Syria. First, he had formed a new government that included a Ministry for National Reconciliation. Then he declared that every effort of this ministry, and in fact, of the entire cabinet, effectively contributes to the rising violence. So how can you have dialogue with a man who has declared war on his own people? We are willing to negotiate with any party that would agree to reestablish Syria as a democracy. Democracy is our principal condition. We are not going to play games. A dialogue should not be a game. Our country is falling apart, and we are not going to mask this break-up by staging a “dialogue”. RT:This statement suggests that all opposition groups are united in rejecting a dialogue with Bashar al-Assad. Is there a relevant provision for that in the Document of National Accord? MK: It is there in the transition plan, which provides for two stages within the transition period. Stage one shall actually start with deposing President Assad, and stage two shall include reforms that will make us a democracy, such as appointing a government of national unity, electing a new parliament and adopting a new Constitution. RT:Are you confident that the revolution in Syria will not end up an Islamic revolution? MK: We have emphasized in our deliberations with Foreign Minister Lavrov that there is a strong tendency for that. And the longer the crisis, the more radicalized it becomes. But the more they press, the starker the opposition from the Syrian people, who will not allow their country to go fundamentalist, just as they won’t allow arms shipments to continue. RT: Do you believe it is possible that Moscow might host a delegation that would represent all of the Syrian opposition in the foreseeable future? MK: I hope this will happen. And even if it does not represent everybody, at least it should represent the majority. RT:What do you think about the recent split within the military in Syria? Is it evidence that some of the big shots in power have realized the regime is doomed? Or are they still convinced that the Assad government is doing the right thing? MK: First of all, it shows the government’s reliance on violence has proven a failure. Secondly, it shows you cannot break the spirit of the people, and those with the regime have just realized this. It has become apparent that our country needs a different solution. Finally, it shows that peaceful protests by the people will eventually bring about the kind of outcome that the people see as desirable. RT: What about the alleged involvement of Iran – is that mere speculation, or are there specific facts to back this up? MK: This is not just speculation. When Ayatollah Ali Khamenei declares that Iran will not permit a toppling of the Syrian regime, this is no speculation. He sees Iran as one of the parties to the crisis. He says that a collapse of the Assad regime will be a defeat suffered by Iran. But I hope it will be Ali Khamenei who will get defeated in Syria. RT: You played a very active role in the recent conference in Paris, whereas in the past, you used to be rather reserved in respect of international processes of this kind. Does this mean you do support international intervention now? MK: It doesn’t mean that at all. The Paris conference was not intended to make military intervention possible – it was meant to support the people of Syria. 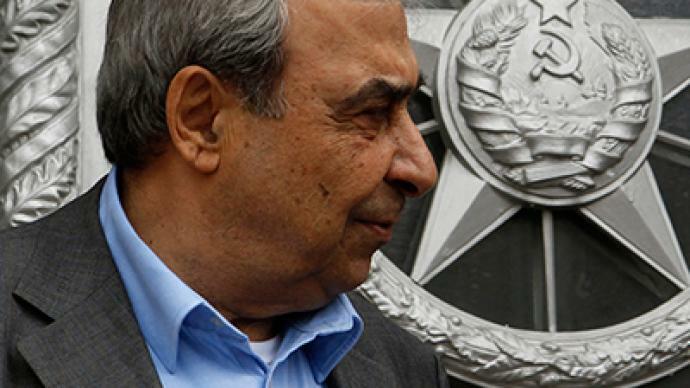 It did not assert the Syrian National Council as the sole legitimate representative of the Syrian people. What urged us to take an active part in the meeting was the realization that the only parties represented in its deliberations will be those who come to the table. Certainly, the conference does represent somebody. But we need to be clear that no single group is capable of toppling a despotic regime such as the Syrian government, especially if they haven’t got the public on their side. And now we have some people based outside Syria come out and claim that they are the opposition and the people stand behind them. What it really is, is a caricature of politics and an insult to the people. 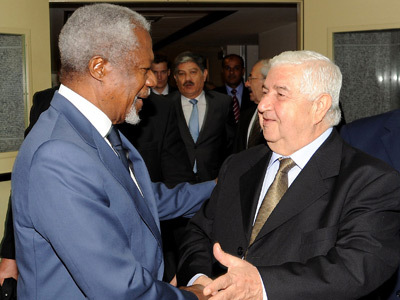 The Syrian National Council was merely one of the parties invited to the conference. They should realize that they are but one group within the opposition, and they are not entitled to speak on behalf of the entire opposition. And they seem to be starting to realize this, however with difficulty.